1991 - Trevor Brooking, Michael Thomas, Werner Kern appear the camp. US U-17 team trains in Lake Placid prior to the FIFA U-17 World Cup in Italy. Lake Placid welcomed the U-17 national team. 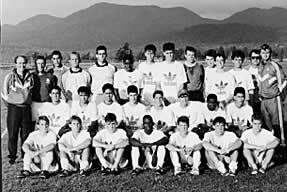 Many players in the picture now star in the MLS. Michael Thomas coached at camp. In 1989, Michael won the championship with Arsenal scoring a very late goal that sealed the championship. Trevor Brooking, one of England's finest, was at camp.